Nestled under the shade of a 100 year old pecan tree, the Shady Grove opened its doors to Austin in January of 1992. Styled after the architecture made popular by the State Parks of the 40's, the restaurant offers home-cooked, family friendly relaxed dining while reflecting Austin's appreciation of the outdoors and live music. 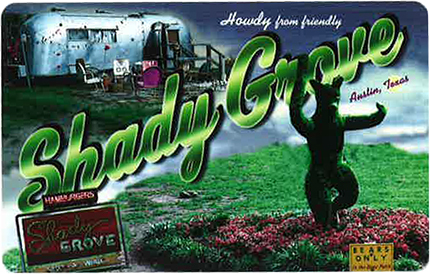 With a reputation for much more than fantastic food, the Shady Grove's classic jukebox and expansive patio have also been the recipients of many "Best of Austin" Polls. Starting in early April and running through mid-September, people of all ages have the opportunity to experience Austin's longest running free live music series on the Jimmy LaFave Stage. 2018 will be the 25th season of KGSR's "Unplugged at the Grove" and, as always, promises to be the best one yet! Along with rockin', the Shady Grove guests love relaxin'. Reminiscent of long summer nights at the drive-in, the restaurant's Starlight Theater features fun family favorites for the holidays, old westerns, sci-fi flicks, and 80's blockbusters. The classics have never looked better than when seen under the stars. So grab your friends, come on down, and stay awhile with a world-famous frozen Shady Thang! Protect your gift card like cash. Gift cards do not expire. There are no dormancy or monthly fees. For balance inquiries call the phone number to a Shady Grove Restaurant's location below.